This is a blog post about Untappd. If Untappd makes you angry at them young’uns in the pub with their phones and their Pac-Man video games, this blog post may only serve to raise your blood pressure, so you may want to leave. Since London Beer City started, I haven’t really logged that many beers onto Untappd, and I’ve had a lot of new beers in the past few weeks. Normally the ‘newness’ is the key motivation for me to check something, not necessarily in a ticking instinct, but so that I have some record of when I first tried it, how strong it was or which batch it was for future reference. Lately, I just don’t have the energy for Untappd. I got into it only a couple of years ago, having seen others use it and enjoy it. The badges, the social network aspect, the toasts, it all seemed fun, and simply anyone who was anyone was using it, so I gave it a go. Like many forms of social media, it’s addictive. Not just because it merges so neatly with one of my main pastimes, but also because it’s so easy. It becomes a ritual. We see each other all reaching for our phones as we return to a table with our new beers. I don’t have any beef with people using Untappd in pubs, nor do I have any problem with social media becoming part of the way that we enjoy and discuss beer. Still, I simply don’t enjoy using Untappd anymore. There’s no such thing as ‘casual’ Untappd use, or rather, there’s no point to dabbling in it. You either check in every new beer you have, or why bother using it? The idea is to contribute to a global social network of beer lovers sharing and commenting on each other’s beers. I like the social aspect of it, but Twitter already fulfills that function. Now, despite appearances, David is a shrewd chap and has a healthy attitude to beer geekery. That and his other tweets on the subject very much mirrored my own feelings. It provided the necessary prompt in my mind to really think about it again. What do I get from Untappd? I tweet about beer without its help, can share photos of beers I’m enjoying without its help, keep notes about beers I’ve had without its help. The useful functions: the searchable archive of beers I’ve had for the first time and when; and the ability to see where beers are being enjoyed near me (which has helped me when visiting a new area a couple of times), are just that – useful, but not essential to my experience of beer. If anything, it causes me more annoyance than satisfaction on average. The Android app is clunky, and frequently crashes when uploading photos, despite several updates. I’m not sure what I want a beer app to be, or even if I want a replacement for Untappd. I’m certain that, once I delete it from my phone, I’ll experience some cravings. I’ll get my fix other ways, through Instagram, making little felt badges to stick on my Craft Sash at home, Twitter, and so on. I’m also hoping that, as a side effect, instead of logging every new beer with a few choice flavour descriptors, quitting Untappd will encourage me to actually write about the beers worth writing about. Is Untappd still doing it for you, or is it something that was fun for a few summers and now needs to go in the loft? I must admit I’ve never actually used Untappd although I’ve seen it pop up in my Twitter timeline a lot. I use it a lot more sparingly than I ever used to. I will wait until I’m not speaking to someone or the next day to log and make any comments that I don’t want to forget. I’ll rarely log a beer more than once, and if it is it might be out of boredom (waiting for someone) or because I have a new comment to add. Recently on a trip to NZ, I had no data and logged barely any beers, despite ticking a whole lot. At the end of the day, it didn’t matter either way. The beers were still awesome. It’s a fun tool at the end of the day. I think I’ll always use it in some capacity. “At the end of the day, it didn’t matter either way. The beers were still awesome.” That pretty much sums it up for me. Great to hear that you actually met people through using it, too. I’ve met lots of great beer people through Twitter (or rather, have known them on Twitter first), so it’s good to hear that the social aspect exists with Untappd, too. One of the guys at the bottle shop uses untapped but I know of no other people that do. I first of all started writing a diary, then went onto ratebeer as it gave me discount at bottle shop and now I write on my blog although there are always beers that slip through the net and now I’m kinda of getting bored of it all again. I just like having a record of stuff, so that when I see a beer and think ‘have I had that before?’ I can look it up and go ‘oh, yeah, I had that at X place at X time, OH YEAH! Now I remember.’ It’s like a little trip down memory lane for me. I’m not fussed about badges, toasts or anything else. It’s just a digital record for my own use. I love using Untappd, for the reason that Emma mentions above, plus the very reason I still use Facebook: I have moved around a lot, I’ve met tons of people, and I like knowing what they’re doing. I love to see what my friends in Paris, London, or Chicago are drinking. I like seeiing how many beers I’ve checked in at our flat, or at a specific pub. I like seeing the evolution of my ratings/tastes. I will never, ever, ever write about beer. Even in person, my comments about beer are exclamations of only about 100 characters. I have a short attention span. I like badges. I absolutely understand why other people would walk away from Untappd, but I am going to tick and yell until the day I die or the day the app goes away. They might be the same day. I hope I get a badge for it. Oh man, posthumous badges. That’s got me tearing up. Yes, the archive aspect is handy, and I dare say there’ll be a few times in the future when I’ll wish I still had it for that, but that’s it – just a few. For non-bloggers, I think it’s great that it encourages people to describe what they like, and have conversations about it, and as you say, see what each other are up to. It’s great when it works for you, and I would definitely feel the same if I got out of it what you do. You also raise a terrifying prospect: what if the app DID no longer exist for whatever reason? Quitting is one thing, but going cold turkey if it disappeared would be something else entirely (especially if you’d checked in 2499 beers etc). Love hate relationship. Only tap in new beers in general but I like the fact it encourages you to think about why you like / dislike a beer and get the thoughts down. Great for all the things you mention but sometimes infuriating when I want to record a beer and find myself embarrassingly tapping on my phone in the company of others when at the pub. I feel Very rude. I’d tend to agree with most of that, plus I’m not a heavy Twitterer so Untappd offloads that element for me. Untappd also sems far easier to search than Twitter – if I can’t remember trying a beer before, then as long as I checked it in, Untappd will tell me pretty quickly. If I have the time then I do use Ratebeer too, as it makes me think even more about what I’m drinking and why it’s good or bad. Yeah, agree that prompting people to say what they think is a good thing. I also agree that it can make one feel self-conscious around non-users. One for a future craft beer etiquette guide, I think. I have found that since using Untapped I haven’t wrote blog reviews on beer as much, which is a shame as I usually sit and research about the brewery etc if it is new to me and include that information as my tasting descriptions are not up there with other peoples so I need to bring something different to the table… Maybe it is time to blog more and un tap the untappd! It’s so convenient isn’t it? We’ll see if not having it there encourages me to write more. I wrote about this in similar fashion back in April 2013 to as I recall a mixed response. I’d started using Untappd but found that it stopped me having the online conversations I’d been having, twitter interactions and such. That said, it was earlier days for twitter too. I’m not trying to make everyone think about quitting Untappd, I just think it’s worth evaluating exactly what this kind of app adds to our experience of things. For example, the benefits of being on Twitter are such that I can’t even ENTERTAIN the notion of quitting it (Cold shiver down my spine). I like the gamification aspect. For drinkers just getting into beer it starts them off on a journey and gives them a bit more excitement that will push them to try new things. Even for experienced craft beer fans, it adds an extra element of fun. That said, I never said to myself “I’ll try a sour tonight, so I can unlock that badge!” It’s quite a passive experience, that distracts a little from the more active one of actually drinking and enjoying new beers. If I spent a little more time off my phone, I could have tried the beers my friends were drinking. I spent too much time trying to add the right location and not enough time talking about the beer. Gradually, and not through a deliberate choice, I gradually used the app less and less and now I only do if I’m working on something that needs a social media presence. There will come a time when every beer nerd graduates from Untappd. Some will graduate to more serious things like proper tasting notes and more complex tools (like an app idea I’ve been toying with), but many will graduate to fining awesome beers on their own, without the need for a grown-up Pokedex. Thanks for those comments, Niall. I feel much the same way. I think my problem was that I put off joining Untappd in the first place because I thought I would reach this point eventually, and now, looking back, I’m not sure what I really gained from it all. As you say though, it’s definitely a good start for people getting into beer. Really interesting post, Chris. Good luck in The Priory! I am relatively new to Untappd, about 6 months. Unlike others, I log all beers, new and old alike. It’s turning into a compulsion, but your post has really made me think about why. I still don’t really know. But one thing Untappd has made me think about is how often I drink. I’m not a binge drinker, but I do drink regularly. And Untappd has made me realise how regularly. It’s not something I’m concerned about, but it has opened my eyes. So perhaps it has the potential to save someone? 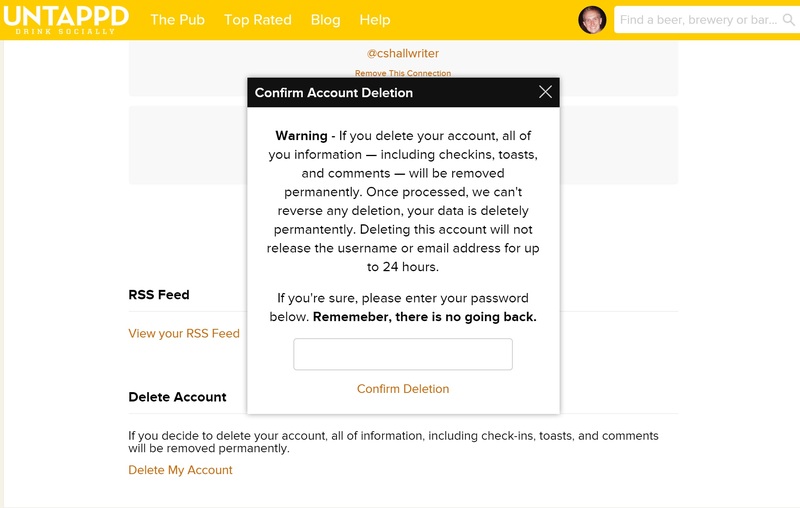 If you find errors or duplicates on Untappd, please do report them, either through the app or on the support blog. There are lots of moderators (me included) just itching to eliminate them! I like the idea of Untappd, and I was actually tweeting beers in 2008 but never found what the right hashtag was to find similar beer geeks if there were any. Untappd is better as a journal of drinking and I actually have used it to remember whether I’ve at least logged a beer. It’s become habitual but it’s not essential. I think. Great topic, Chris! Similar to a lot of the other readers here, I started using Untappd for personal use quite a few months ago, but after the initial allure due to the “game” aspect, it lost my attention for most of the last 6 months. I’m not too sad to say that I haven’t used it much recently, and I don’t believe it has taken away at all from the beer tasting experience that has continued without it. That being said, I do use it to look up beers every now and then. With the launch of our new blog (mission: to visit and write about all the craft breweries in New England), we have considered revisiting Untappd for purposes of our blog and documenting craft brew reviews, as well as supporting the reference/research value provided by Untappd. If not Untappd, can anyone recommend other good “mobile” apps or versions of something (such as Beer Advocate) that would suit someone looking to document and provide numerous quality beer reviews while on a mobile device? Ratebeer app is decent, full access to db search and gives 10 most recent reviews+overall score. also a good placesfinder and the ability to take offline notes. its available on android but not sure if its in the play store or just through the site. Yes, it’s in the market: https://play.google.com/store/apps/details?id=com.ratebeer.android and is generally better than Untappd for taking notes, especially as it works offline. What do you think of the Untappd App? Rightly or wrongly I’ve always felt that my Untappd account was something that I needed to “maintain” rather than something I enjoyed using. I’ve stopped using it. I bring a notebook with my now that I forget to write in just as often as I forgot to check-in on Untappd, I must admit I fell less guilty about ignoring the notebook! btw… love those spelling errors in the picture at the top!